An oven set to Bake and an oven set to Broil both use dry heat to cook food, but in different ways. When set to Broil, an oven's element or burner radiates heat, or infrared radiation, directly on food underneath it. When set to Bake, a burner or element heats the air inside the oven, and not the food itself. Baking uses indirect, ambient heat, while broiling uses direct, infrared heat -- that's why you can substitute baking for broiling, but not the other way around. You do have to make a few minor adjustments in cooking time and temperature, but you can bake the same foods you normally broil. 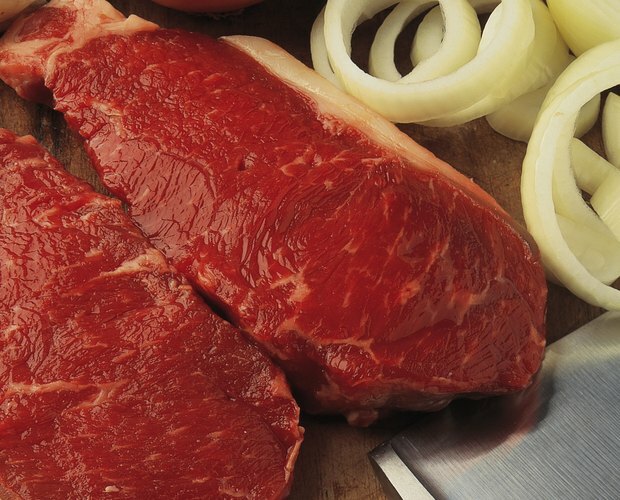 Remove the steak or fish from the refrigerator and let it sit at room temperature for about 15 minutes. Room-temperature meat cooks more evenly and absorbs the sodium in salt more effectively and to a greater depth than cold meats. Room-temperature meat cooks more evenly than cold meat because the inside and outside start at about the same temperature, which causes them to heat at about the same rate. Set the oven to 350 degrees Fahrenheit when baking meat instead of broiling it. 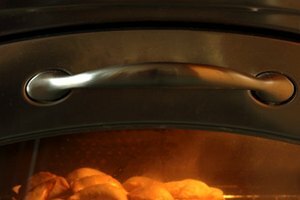 Broilers radiate heat up to 550 F within 1 inch of the element or burner. Because the temperature decreases as the distance from the heat source increases, you can move the steak away from the heat source to control the temperature on its surface. An oven set to bake at 500 F, on the other hand, heats the air to 500 F, so you can't move the meat away from the heat source. So, you have to lower the oven temperature, which lowers the air temperature, to lower the temperature on the surface on the meat. Bake meats for three to four times longer than you would broil them, depending on thickness. Steak usually takes five minutes to reach rare under a broiler, about six minutes to reach medium and eight minutes to reach well done. So, a baked steak needs about 15 to 18 minutes to reach rare, about 25 minutes to reach medium and about 35 to 40 minutes to reach well done. 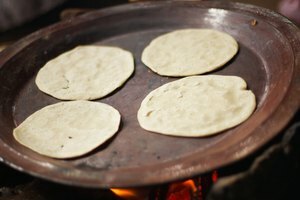 Because heat surrounds food during baking, instead of radiating on it, it takes longer to reach the interior, and therefore longer to cook. 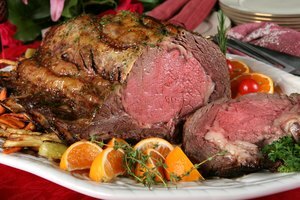 The U.S. Department of Agriculture recommends you cook all whole meats to 145 F and ground meats to 165 F to reduce the danger of food-borne illness.